Has the Catholic Church so comprehensively betrayed the nation of Ireland that it would take the second coming of the Messiah to set things straight? The ever more impressive writer/director John Michael McDonagh may not be trying to rectify the Church’s situation, nor is he bringing about revelation. Rather, he offers a microcosm of the fallout with insight, humor and compassion in Calvary. 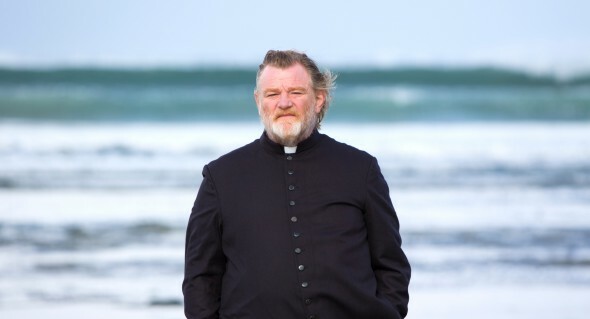 Brendan Gleeson, as brilliant as always, plays Father James, a good priest. As the film opens, we sit inside the cramped confessional as Fr. James waits for the penitent on the other side to begin. It’s not a confession so much as an announcement. The parishioner, whose face we never see, spent a childhood of horrifying abuse at the hands of a priest. But what good is it to kill a bad priest? If you want to really send a message, you kill a good priest. It’s almost too ripe a premise, really, and yet McDonagh’s never stoops to melodrama, or even thriller. As Fr. James goes about his week tending to his parish and reflecting on what’s to be done about this threat, we get the unique perspective of a good, decent man with a collar. The dry, insightful, exasperated humor that saturates McDonagh’s writing is a thrill to take in, and Gleeson has never been better. Never showy, without a hint of sentimentality, he brings this decent but hardly sinless man authentically to life. As Fr. James’s week drags on, McDonagh and his ensemble slowly amplify the wickedness of the townsfolk, creating, finally, a real parallel between the plight onscreen and the allusion of the title. But nothing about Calvary is even moderately preachy. The priesthood is not what it used to be – not for them or for us. And it may be too late to save the Catholic Church. But a filmmaker who can hold up a mirror to our troubled times and find weary humor and redemptive humanity in it is inspiration in itself.